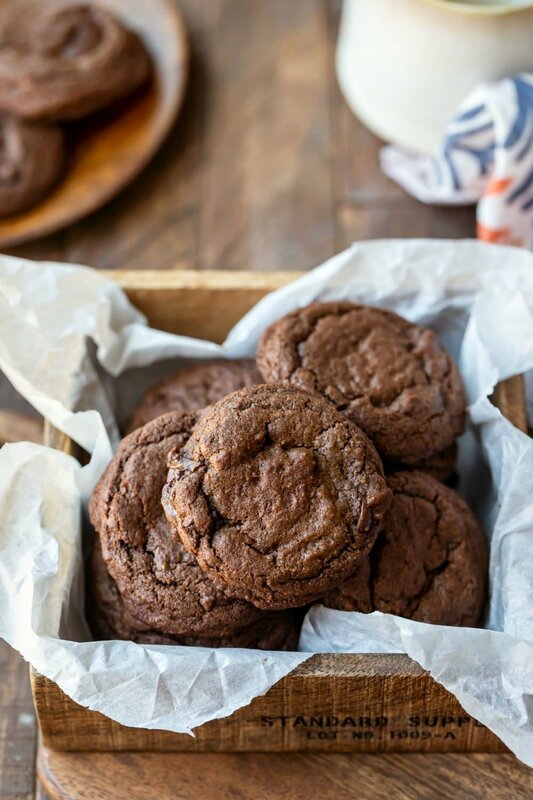 Chewy chocolate chocolate chip cookies are double chocolate chip cookies with soft middles and chewy edges. I love a good chewy cookie! These chewy chocolate chocolate chip cookies are based on my chewy brown sugar chocolate chip cookies. 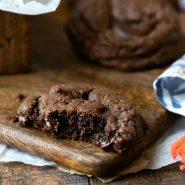 They have soft middles and chewy edges, so they’re pretty much a perfect double chocolate cookie. 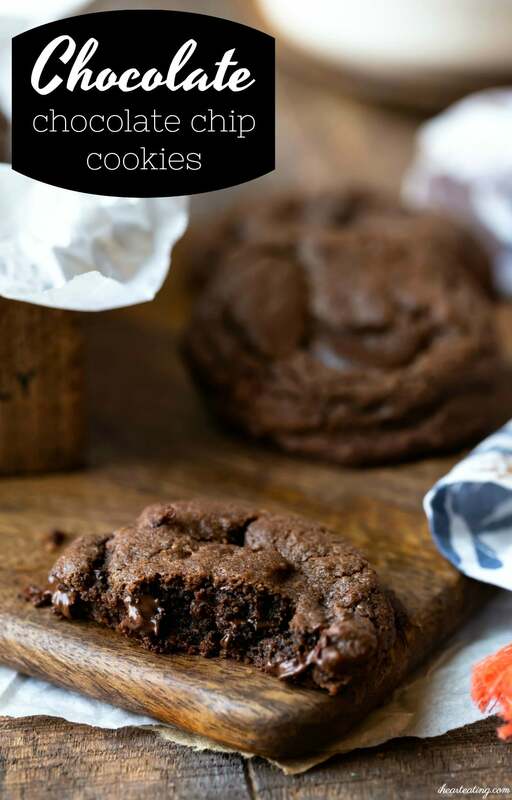 These cookies pack a double chocolate punch! 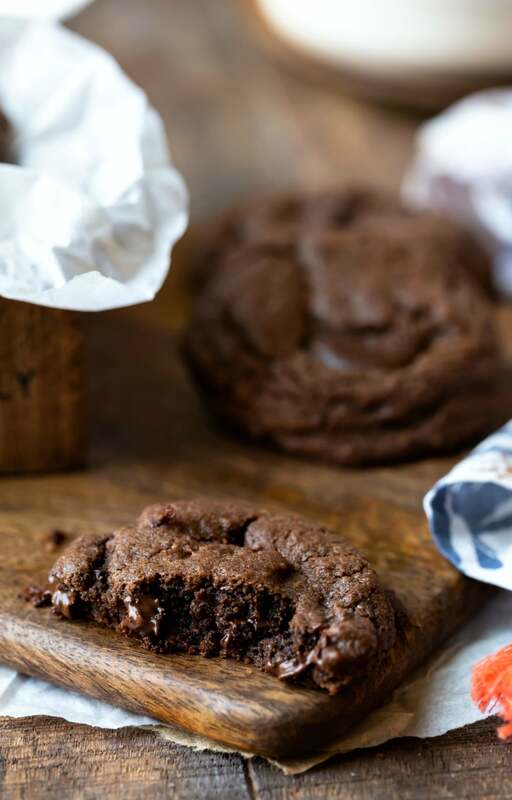 The chocolate cookies aren’t overly sweet, and they’re full of melty chocolate. These cookies start with melted butter, and have plenty of brown sugar mixed in. The cookies have an extra dose of vanilla to enhance the chocolate. The cookies also have a fair amount of cocoa powder to give the cookies lots of chocolate flavor. Can I use a different type of chocolate? Yes! I always suggest using the type of chocolate that you like. I prefer semisweet chocolate in these cookies. If you want more of a dark chocolate cookie, use bittersweet chocolate. If you want a sweeter cookie, use milk chocolate chips in these cookies. 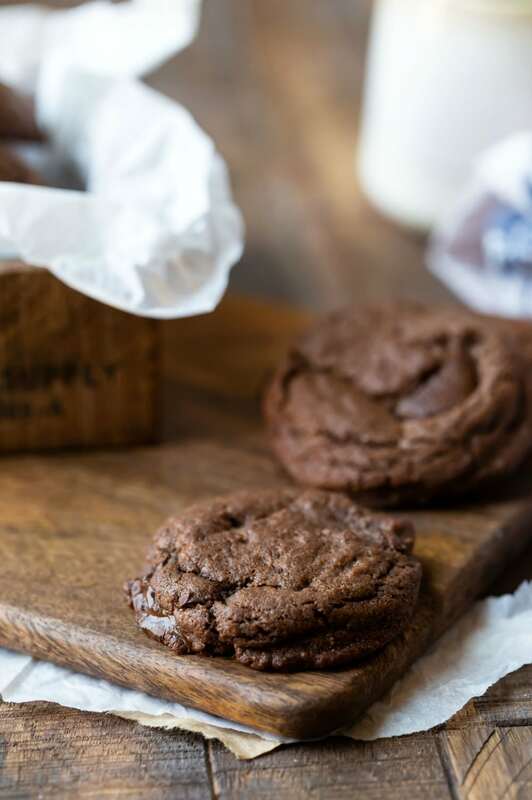 If you’ve tried this chocolate chocolate chip cookie recipe, don’t forget to rate the recipe and leave me a comment below. I love to hear from people who’ve made my recipes! You can SUBSCRIBE to receive my latest recipe newsletters or FOLLOW ME on FACEBOOK, INSTAGRAM and PINTEREST for even more delicious food. Chocolate chocolate chip cookies with chewy edges and soft middles. Bake for about 8-11 minutes, or until the edges of the cookies are set. *Correctly measuring the ingredients is key. I suggest either weighing the ingredients or aerating the flour (sifting or fluffing) and then scooping and leveling. Packing in too much flour will cause the cookies not to spread or to be dry and crumbly. **Can substitute 4 ounces finely chopped baking chocolate for chocolate chips. I like to use semisweet in this recipe. 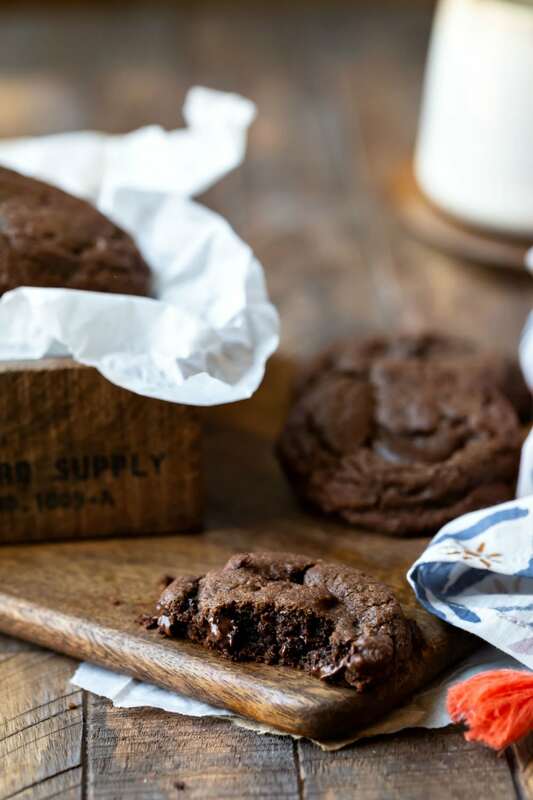 If you prefer a less sweet cookie, you can use bittersweet chocolate. If you prefer a sweeter cookies, try milk chocolate. ***I suggest stirring this recipe together by hand rather than using a hand or stand mixer. Thank you! I’m so glad that you liked the cookies! =) Thanks for commenting! I have not baked them yet I plan to make them for my dad. I am 12 and don’t bake much but just the site of these cookies makes me want to bake a billion. Thanks for sharing this recipe. Yay!! I’m so glad that they were a hit! Thanks for coming back to comment! I have just baked these cookies for my kids. They love them and so do my in-laws. fantastic. Look forward to baking more.. Thank you! I’m so glad that the cookies were a hit! =) Thank you for coming back to comment. I baked the cookies and they looked like crinkles. Cookie didn’t spread out might be bcoz I put too much flour. I spoon and leveled every ingredients. Still delicious to me and will bake this recipe again with less flour. Thank you for sharing them. Thank you! I’m so glad that you liked the cookies. =) Thank you for commenting! These were the best cookies I’ve ever been made! I have a batch in the oven right now.. Super excited to see how they turn out. Every year I host a cookie exchange the 1st week of December and start experimenting with recipes about this time of year. This could be my selection for the year. Thanks for sharing!!! Love!!! OMG These were some of the best cookies EVER!! !